Keep an eye on Palo Alto Networks, Dollar Tree, and GameStop stocks over the shortened trading week. Stocks rose last week, with the Dow Jones Industrial Average (DJINDICES:^DJI) setting several record highs as the S&P 500 (SNPINDEX:^GSPC) trailed closely behind it. 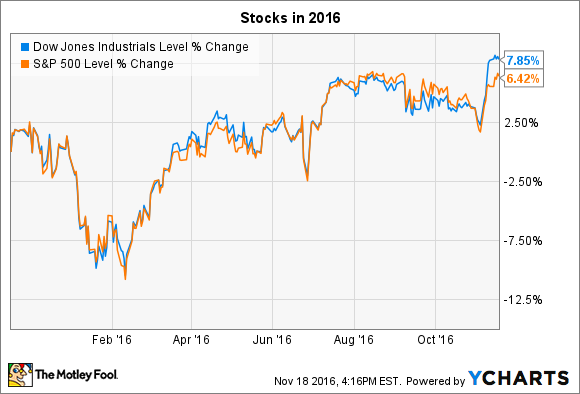 With just a few weeks left in the year, both indexes are up by more than 6%. Markets will be closed in observance of the Thanksgiving holiday on Thursday. Yet even with a shortened calendar, and with earnings season winding to a close, many stocks, including Palo Alto Networks (NYSE:PANW), GameStop (NYSE:GME), and Dollar Tree (NASDAQ:DLTR) are likely to see big moves over the next few trading days. Cybersecurity specialist Palo Alto Networks kicks things off with its quarterly earnings report on Monday. Investors have grown more pessimistic on the stock as sales growth slows: Palo Alto last posted a 41% revenue improvement, marking a deceleration from the 60% figure it enjoyed a year before . Like all industry participants, Palo Alto has seen its outlook shrink as major enterprises delay new IT spending and opt for smaller, subscription based packages over full-featured, pay-upfront suites. Yet thanks to its wider offering, the company has navigated those challenges better than rivals. It gained market share at a faster pace than Fortinet last quarter as it added thousands of new customers to its next-generation security platform. Fortinet has Palo Alto beat in the earnings department and is profitable so far this year. Investors are likely to look past those short-term losses, though, if the company can meet its goal of at least 33% sales growth this quarter. One number that nicely captures the controversy around video game retailer GameStop's stock is 6.4%, or its current dividend yield. With the stock down 17% this year, investors aren't exactly jumping at the chance to own a well-covered payout that's three times the market average. It's hard to blame them at the moment. GameStop last posted a surprisingly large sales decline as growth in its new businesses failed to offset a retailing gaming slump. To make matters worse, in early November executives warned that the third quarter would mark another big drop. GameStop said new video game releases failed to deliver a sales bump as it lowered its revenue outlook for the second straight time. The $3.72 per share that it now expects to produce in earnings marks a slight decrease from last year's haul. Yet it is still far above the $1.44 per share dividend that it is committed to pay. But a market-thumping yield isn't much good to investors if a company's management team can't demonstrate that it has a good reading on the growth outlook of its industry. Dollar Tree's stock is down 15% in the three months since its last quarterly report revealed a stubborn growth slowdown. Comparable-store sales ticked up by just 1%, compared to 2% in the prior quarter. Strict expense control helped the retailer post increasing profitability, though. "Through what continues to be a challenging retail sales environment, we delivered gross margin improvement and managed expenses effectively to deliver earnings at the top end of our guidance range," CEO Bob Sasser said at the time . Investors will be watching closely for signs that Dollar Tree can keep its growth streak at the low single-digit range that Sasser and his team have forecast. At the same time, its massive merger with the Family Dollar business it acquired a year ago has the potential to swing long-term results in either direction. Dollar Tree hopes it will boost overall profitability as executives raise Family Dollar margins up toward its company average. Yet it wouldn't be a surprise to see a few nagging growing pains from an integration of this size.